Aerobility, a charity that gives terminally ill and disabled people the chance to fly, has unveiled its latest aircraft – donated thanks to the fund raising efforts of employees at NATS. The aircraft, a specially modified Tecnam, was bought after an impressive £150,000 was raised by employees at NATS, the UK’s leading provider of air traffic services. The gift of an additional aircraft means Aerobility, which is based at Blackbushe Airport, can help even more people experience the freedom of flight. Mike Miller-Smith, CEO of Aerobility, said: “We are incredibly grateful to NATS for their support over the past year. By having another aircraft in our fleet we are able to extend the gift of flight to as many disabled people as possible. Employees at NATS often went to extreme lengths to raise enough cash. Teams from across the country competed to be the fastest to pull a Second World War Harvard aircraft down the home straight on Goodwood’s famous racetrack. The event, which also included a gala dinner, was organised by the air traffic control branch of the trade union Prospect, and raised £35,000 over one weekend. Elsewhere six members of staff from NATS’ Prestwick control centre raised £2,100 by each completing a 5 mile swim. NATS staff at Luton Airport even scaled the equivalent height of Mount Everest by repeatedly climbing the control tower. Other events included a sponsored long distance motorcycle ride, a 13 hour game of tennis, and countless cake sales and raffles. 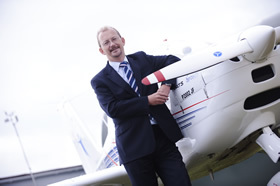 NATS Chief Executive, Richard Deakin, who chose Aerobility as the CEO’s charity of the year, also contributed by raising £4,200 when he completed a 150km non-stop glider flight. Richard said: “It has been an incredible effort by everyone involved at NATS to raise this money. We initially had a target of £100,000, but such has been people’s enthusiasm that we’ve been able to exceed that by another £50,000. As well as the unveiling of its newest aircraft, Aerobility also launched its latest fund raising initiative – an attempt enter the Guinness Book of Records by ‘flying’ around the world, non-stop for 10 days in a flight simulator. Donations are being accepted to fly legs of the journey, with some well-known names having already booked themselves into the pilot’s seat. Among them are Apollo XI astronaut Buzz Aldrin, ex-England rugby star Rory Underwood, and Willie Walsh, Chief Executive of British Airways’ parent company IAG.